Protecting Earth's aquatic environment, forging a sustainable future. Earth is undergoing change in its physical, chemical and biological systems at multiple scales. To reduce and reverse harmful impacts, we must focus on long term sustainability in human endeavors. The UN has recognized this need and established 17 Sustainable Development Goals (http://www.undp.org/content/undp/en/home/sustainable-development-goals.html). Energy production from fossil fuels has released new carbon into the atmosphere, while removal of forests has released CO2 and reduced the capacity for CO2 uptake which adds greenhouse gases into the atmosphere and oceans. Fearless Fund pioneers the scale-up of ocean-based plant production as an alternative energy source and an important contribution to a more sustainable economy. The process beneficially reduces excess nutrients that run off land (and cause dead zones in marine environments). Plant aquaculture today exceeds wild harvest. Atmospheric carbon has increased dramatically over the last 150 years. Our oceans have absorbed significant carbon, and ocean chemistry has changed to become more acidic. The question is: can we produce carbon neutral fuels in our oceans that reduce that acidity? Fearless Fund uses the CO2 from our oceans to produce plant biomass, which is repurposed to produce energy and co-products. Increasing acidity is important because it requires more energy from shelled organisms--a vital part of the food chain--to make their shells. If organisms like oysters, mussels and clams were to disappear all together, what would be the cascading impact on their predators (including humans) and the systems that benefit from their filtration? 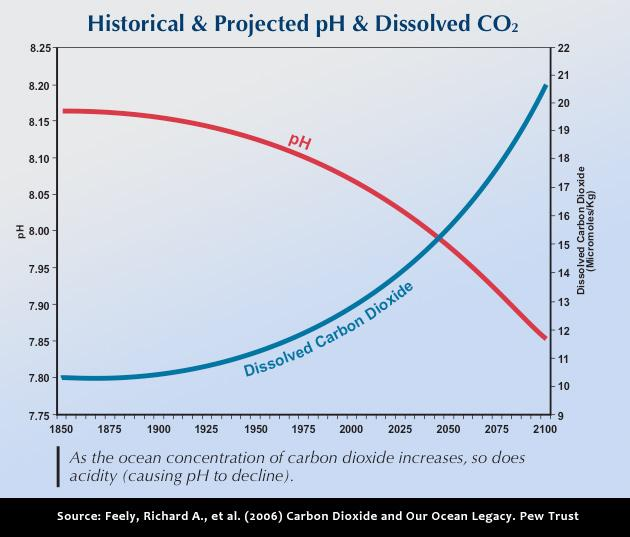 The process of removing CO2 from our oceans--while not better than reducing the burning of fossil fuels in the first place, has the potential to mitigate declining pH at the farm location. Earth's global population is on course to grow to 8.6 billion in 2030, 9.7 billion in 2050 and 11.2 billion by 2100. How will we provide food, energy and water for expanding populations? Long term sustainable practices--by governments, companies and individuals--can assist the restoration of our ecosystems and ensure biodiversity and productivity.